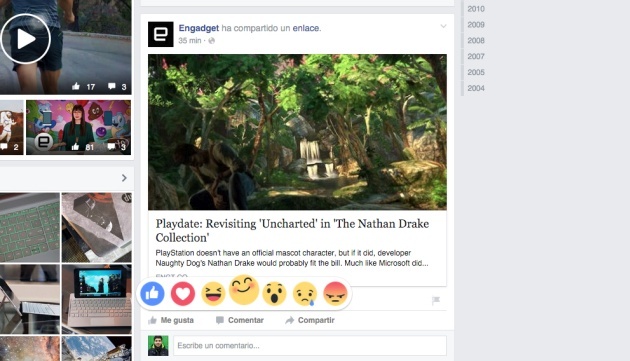 Last night Engadget brought you a sneak peek at Facebook's new "Reactions" feature, and today the social network confirmed it's now in testing. Instead of the often-requested "dislike" to counter the existing Like button, founder Mark Zuckerberg explains(in a video embedded after the break) that this idea is just about giving more options to express yourself. Whether or not the feelings of love, sadness and empathy are what you're trying to project, the test is currently limited to users in Ireland and Spain. If you are there (or use a browser proxy service like Hola to fake it) you'll see something like the picture above, after long pressing the Like button on the website or mobile apps. Depending on how things go, this could roll out to the rest of the billion or so Facebook users soon, but it looks like any official support for dislike is never going to be in the plans.